With your permission I’m going to write a different kind of wrap this week. It may feel like a bit of a ramble, and it gets personal along the way, so consider yourself warned. 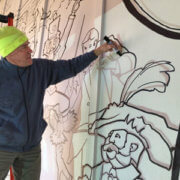 I thought I’d let you know that the mural on the breezeway wall is finished and signed. 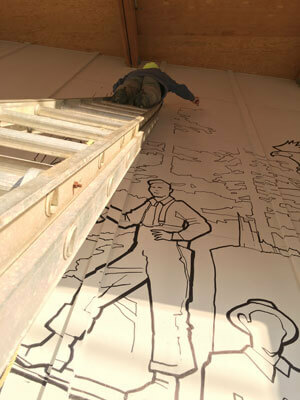 Fun project, thanks again for the permission to draw on our beloved building. You need to get on down here if you haven’t been by our building in the last few months. It’s really remarkable. To me, the project is the palpitating presence of this phrase I keep putting out there . . . Support what you love; make time for art. The project was Bruce’s idea and his gift to all of us. The wall was there, it looked like it needed a mural, he asked, and I said yes. And off he went. And to answer the next question . . . we’ll paint it out in the spring and make way for the next project (think 4th grade birds). The better question is, who’s after that? So I’m grateful in particular to have watched this project unfold. I’m grateful to Bruce that he so visibly made time for art and in the process supported what he loves . . . art, VCA, this building, all of us. What a wonderful start to the holiday season and a reminder of the power of art to show us something new. Seventeen years and a couple of months ago I got on a plane and flew to New York City. The day was September 10, 2001. I went there with the purpose of attending a meeting in the World Trade Center at 9:00 AM on September 11. 9/11. For reasons I’ll never know, I decided that night, 12 hours before the first plane hit, to not go to that meeting. Instead, I was in my hotel room uptown watching the events of that day unfold. Instead of being one of the 2,974, I’m here on Vashon. A few days later I wrote and published an essay called 9.11.01 (written the week after). It’s out there on the internet somewhere if you go looking. With your continued indulgence, I thought I would quote from it. The larger events will now unfold beyond the control of people like me and you. What is in our control are the thoughts that we think, the feelings that we feel, and the choices that we make. I can choose to love or I can choose to hate. I can choose to listen to that voice that always seems to be whispering in the background, or I can choose to be distracted by all the noise that goes on in the foreground of my thinking. I can choose hope, or I can choose fear. I can embrace life, or I can brood on what might have happened or what happened to others. I can share a kindness with a loved one or a stranger, or I can shake my fist in rage at someone who cuts me off in traffic. I can forgive my friends and colleagues their seeming foibles or I can assassinate them with my gossip and spite. I can embrace the wonder of today, whatever it may bring, or I can grind though waiting for the weekend or a vacation or some better day sometime in the future that never may come. I can go to bed tonight knowing that I’ve told my wife and children that I love them, knowing that they love me, or I can let the opportunity to say I love you pass me by yet again. And in choosing love and life every day, I believe I put wings on my feet and a shield of protection before me. The thoughts we think and the feelings we have are our true reality. Fill your thoughts with fear, doubt, hate, and spite, and you’re going to have that kind of day, that kind of life. Fill your thoughts with life, truth, and love, whatever those words mean to you, and you’re going to have a very different experience. I think about 9/11 a lot, as you would expect. It no longer has the hold on me that it did, but it’s there. I made a choice and everything was different after that. It’s a frequent reminder to be grateful for every day, to find the grace notes in things that make me grumpy, and apply my energies to work that makes a difference. And yes, I pay attention to the choices I make. Coming full circle, I have that same feeling about choices when I think about the artists I meet here at VCA. As I write, there is some amazing art on our walls (and hanging from our ceiling!) besides Bruce’s mural. And just yesterday, 18 wonderful poems that were written in response to that art were added to our walls. Some make me weep. Each of those artists (visual and poetic) made a choice to make that art. Those choices were intrinsically hopeful and optimistic, that making art matters even if the artist doesn’t altogether know why at that moment. And everything is different after that. This organization, this building, are here because thousands of people through the past half decade made millions of choices, big and small, to get us to this point. And everything is different as a result. Count me grateful for all those choices. Going forward, I believe we have an opportunity to do something wonderful together here are at VCA. Let’s choose to make the best of that opportunity. I don’t think we have a day to loose. Sometime during this thankful holiday season I hope you’ll find time to come experience some of the magic that’s on offer every day at VCA. 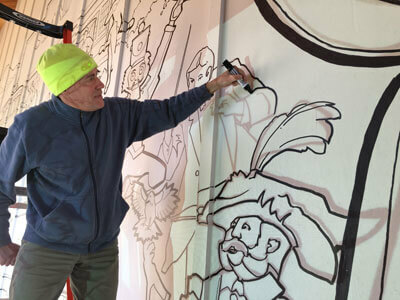 Come see the mural. Come to one of our wonderful concerts. Come see the Nutcracker. Or just come and sit with the art. Support what you love; make time for art. A friendly reminder (including to ourselves) that the Wordless Stories Closing Party and Poetry reading is THURSDAY, November 29th starting at 7:00 PM! (NOT Wednesday.) See you there!